There’s a Billy Goat in the Garden is another book I discovered at the nursery. There is a naughty billy goat in the garden, and he will NOT GET OUT, all the animals try to help proclaiming they can do it because they are bigger, but none of them can. All the animals laugh when the bee says he will do it “You silly, itty-bitty, bee, you can’t get that billy goat out”. I love this book I really do. I love to hear the kids chiming in “I’m bigger” “…will NOT get out”. They say which animals are going to get the billy goat out, can they do it? It’s a great oppertunity to talk about how being small doesn’t mean you don’t matter. All ego boosting! The pictures tell more of the story. The billy goat messing up the garden, his naughtiness, the horror of the owners of the garden, the goat’s fear of the bee. Unfortunately you don’t seem to be able to buy it new from the normal sources (amazon, the book depository etc.) but you can get it new or used from private amazon sellers. I love this! 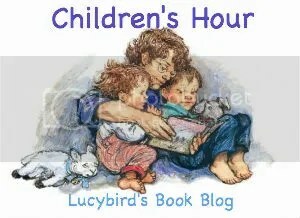 As a children’s author, there’s nothing I love more than the image your Children’s Hour conjures of a circle of little ones looking at the pictures and commenting in their adorable voices. It’s one of my favourite times… when they’re listening at least!